Fingerprint unlocking is combined with key unlocking. High security and drill resistant lock cylinder. One Lock can lock more than one bike. Easily fixed to the Handlber,Seat Post and so on. Complete configuration,perfect match,a multi-use lock. Crowdfunding platform Xiaomi is updated every day with new products. Now the AreoX castle is presented on it, which is supplied under the number of U8 model by Shenzhen Mars Exploration Technology. The device belongs to the category of intellectual, because it is equipped with a fingerprint scanner. There are two differently sized castles on the crowdfunding. 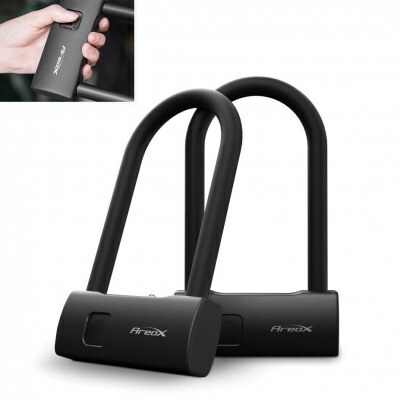 This device can protect against theft of a bicycle, shop, house, etc. Therefore, the variability will be just the right thing to do. The dimensions of the first lock are 224.8 × 130 × 32.2 mm, the second model is 300 × 130 × 32.2 mm. The weight of the presented product is 1200 or 1360 g, respectively. The AreoX lock is equipped with a 260 mAh battery and a USB Type-C port. It takes 1.5-2 hours to fully charge the battery. In standby mode, the Xiaomi device can last about 12 months. The gadget is made of zinc alloy, PVC and stainless steel 420. This means that the AreoX lock is guaranteed to work smoothly, work flawlessly in rainy weather and will not be terrible rust with time. The device will save the user the need to carry the keys to the lock. Easily lockable and unlockable, the AreoX lock makes life easier for everyone. All you need to do is scan your finger to lock/unlock the gadget.